Local designer, Renee Hill of Harx 4, sewing her creations as a Project Runway contestant. She's the show's fourth contestant to hail Philly. 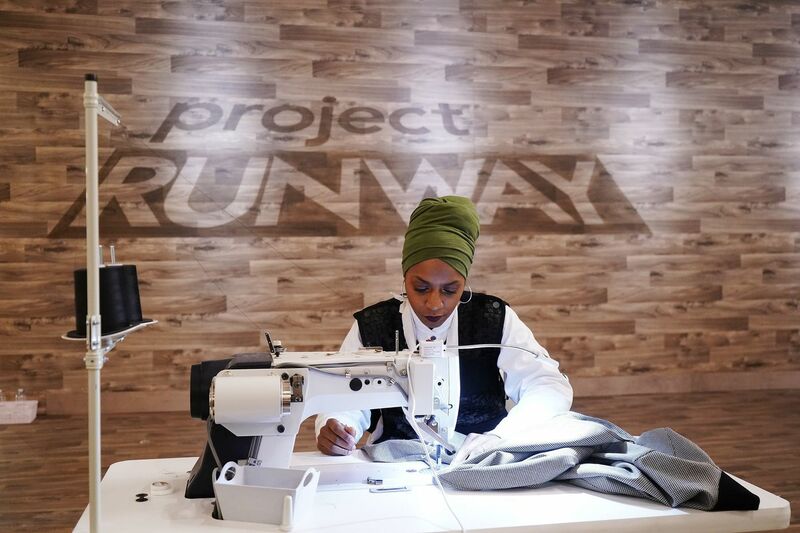 Project Runway is bursting its seams with newness — its 17th season kicks off Thursday night on Bravo for the first time since its sixth season. There are other notable changes, too. It’s auf wiedersehen to the fashion reality show’s original supermodel host, Heidi Klum. And, “What’s up?” to millennial cover girl Karlie Kloss who, for the record, just returned from Paris, where she walked the last Chanel runway show with the late Karl Lagerfeld at the helm. I’m going to miss the endearing way mentor Tim Gunn encouraged contenders to “make it work." Gunn and Klum are off to a new show on Amazon. Yet I’m incredibly curious to see how Season Four Runway winner Christian Siriano will fill Gunn’s kindhearted shoes with a little bite, I hope. But for Philadelphians, the good news is that we can call one of Runway’s 16 contestants homegirl. Renee Hill, founder of the luxury clothing label Harx 4, is among the designers who will compete for Runway’s biggest purse ever — $250,000. The winner will earn a feature spread in Elle magazine (Elle editor-in-chief Nina Garcia returns as a judge. She will be joined by designer Brandon Maxwell and former Teen Vogue editor-in-chief Elaine Welteroth) and a chance to be mentored by members of the Council of Fashion Designers of America — the organization that once sat at the helm of New York Fashion Week. Hill is the fourth Philadelphian to compete on Runway. Former Philadelphia University student and professor Jay McCarroll was the show’s first winner, in 2005. Dom Streater won the 12th season, and the fifth season of Project Runway All Stars. Kristin Haskin Simms competed on Season Eight but was eliminated after five episodes. This season, contestants will be treated to a spankin’ new workroom, and the challenges will embrace the nuances of the changing fashion industry, including flash sales, fast fashion, slow fashion, and plus-size models. They will also reckon with the impact of social media, especially Instagram. During the 90-minute show, viewers can look forward to guest appearances from Grammy-winning rapper Cardi B and original urban street wear designer Dapper Dan. Loyal Inquirer readers have seen Hill’s work before: Four years ago, I featured a Harx 4 cashmere cape on the cover of the 2015 holiday fashion preview. We featured this Harx4 cape on the cover of the Philadelphia Inquirer's holiday fashion section four years ago. She also has shown her collection at Philly Fashion Week. We caught up with Hill, 52, who has moved from King of Prussia to North Jersey — she recently got married for the inside scoop on her Runway experience. Tell me about your fashion background. You took fashion design and sewing classes at the MADE Institute, right? Yes. I first started at Moore College five years ago. [Before that, she was a work-at-home mom] But I quickly realized I wanted to do more. So I started working with MADE back in 2013. That is where I learned pattern-making, tailoring, and took all of the advanced courses I needed to build my skills. How would you describe Harx 4? Harx 4 is a luxury sportswear brand for both men and women. It’s a brand that focuses on free expression. What I try to do is spin sportswear in a way that people feel comfortable expressing themselves. I’m very visual, so textures are important to me. For example, I have a collection coming out called Dark Shadows that mixes textures to give the illusion of shadows. Anything visual. I keep my eyes wide open. I look at everything. It can be a light. It can be a flower. You are a Muslim woman. In recent years, Musilimahs have had what some may call a positive influence on fashion by helping to usher in a more modest movement. Has this inspired your work at all? I know that Islamic culture has changed fashion and Muslim women have made tremendous strides through fashion. [Many] top designers are changing their collection to fit a more modest customer. But I have not branded myself as a modest fashion designer … I don’t want people to put me in this small box. If you put me in the box of Muslim fashion designer, then I’m on this platform of being a Muslim fashion designer and you will forget all about my fashion. When you think of Yohji Yamamoto or Eileen Fisher, you think of them as conservative, not modest. When you see my clothes, they are not modest. They are nice. They are stylish. What made you apply to Runway? A friend of mine sent in my name and the producers reached out to me via email. I was reluctant at first. I watched the show and thought, ‘Do I want the pressure and stress?' But I knew that I wanted my brand to gain a substantial amount of traction quickly ... So I decided this is a no-brainer and decided to just go ahead and do it. Is there anything you want emerging designers to take from your Project Runway experience? You have to put in the work. The fashion industry is not all glamour. So many people just don’t understand that. It’s so much work. If you don’t have a passion for the work, you will quit. But if you have the talent and the passion, you will stay in it. 8 p.m. Thursday on Bravo.